I finally caught up with the new edition of Versification, (presently the front page of the site) a bit of Sunday morning therapy through prosody. The first article, on the possibly exaggerated modernist credentials of Emily Dickinson, is a bizarre thing that seems to want to be edgy and cool, spending time comparing Dickinson to a visual poet who played at Möbius strip-mining with Eikon Basilike (a bit of a look-forward to the later Milton piece), and with whom there is no conceivable connection. It also does go on about an apparent saw that you can sing all Dickinson's poems to the theme of Gilligan's Island, an rather sophomoric bit of pablum. The second article is a punctilious, frequently baffling, over-argued, and generally dreary exposition of pervasive syllabic verse in W.H. Auden. Luckily I persevered because the last two pieces were true delights. The last article is a review of Latin Word Order: Structured Meaning and Information, by Devine and Stephens (Oxford University Press, 2006). It sounds like a wonderful volume, and I've added it to my Amazon wish list for whenever I can afford the $85. Any book that dwells with insight over the contrasting word order of socerum tuae filiae versus filiae tuae socerum is irresistible to a language geek. The third article, "The Legacy of T.S. Eliot to Milton Studies" discusses "the Milton controversy" of the twentieth century, triggered by Eliot's early attacks on Milton. I've never seen the controversy as a big deal. In my own taste I go from enjoying Milton's earlier "L'Allegro" and "Il Penseroso" to admiring but not at all enjoying his magnum opus "Paradise Lost." I certainly understand the urge by Eliot and cohort to elevate Donne and the Metaphysics, cavalier spirits of rotund urbanity, compared to the dour asceticism of old Roundhead Milton (and yes, I know The New Critics would have shied away from such biographical tinting, but I'm not really one of them), but many of their specific criticisms have never really been credible, and this article presents a useful survey of the vigorous response to the anti-Milton camp. One flaw I found is in Sherry's lumping in with the New Critics Robert Graves's own anti-Miltonism, best known from his novel Wife to Mr Milton. It's important to separate Grave's objections, which were more on moral grounds tha n on prosodic, from Eliot, whose objections focused on his poetics. The Graves who wrote the "These be thy Gods, O Israel!" lecture would be furious to find himself lumped in with the agenda of "the 'most 'significant' modern writers." Mr. Triple Goddess Graves could never tolerate any betrayal of the women in a poet's life, despite the fact that his own relationship with Laura Riding included every usual human frailty. As far as he was concerned, Eliot's sins were even more foetid than Milton's. My attitude to Milton must not be misunderstood. A man may rebel against the current morality of his age and still be a true poet, because a higher morality than the current is entailed upon all poets whenever and wherever they live: the morality of love. Though the quality of love in a painter's work, o a musician's, will endear him to his public, he can be a true painter or musician even if his incapacity for love has turned him into a devil. But without love he cannot be a poet in the final sense. Shakespeare sinned greatly against current morality, but he loved greatly. Milton's sins were petty by comparison, but his lack of love, for all his rhetorical championship of love against lust, makes him detestable. With all possible deference to his admirers, Milton was not a great poet, in the sense in which Shakespeare was great. He was a minor poet with a remarkable ear for music, before diabolic ambition impelled him to renounce the true Muse and bloat himself up, like Virgil (another minor poet with the same musical gift) into a towering, rugged major poet. There is strong evidence that he consciously composed only a part of Paradise Lost; the rest was communicated to him by what he regarded a supernatural agency. The effect of Paradise Lost on sensitive readers is, of course, overpowering. But is the function of poetry to overpower? To be overpowered is to accept spiritual defeat. Shakespeare never overpowers: he raises up. 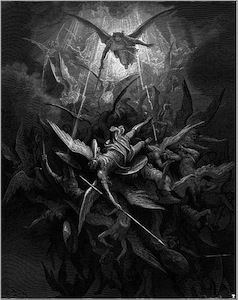 To put the matter in simple terms, so as not to get involved in the language of the morbid psychologist: it was not the Holy Ghost that dictated Paradise Lost—the poem which has caused more unhappiness, to the young especially, than any other in the language—but Satan the protagonist, demon of pride. The majesty of certain passages is superhuman, but their effect is finally depressing and therefore evil Parts of the poem, as for example his accounts of the rebel angels' military tactics with concealed artillery, and of the architecture of Hell, are downright vulgar: vulgarity and classical vapidity are characteristic of the passages which intervene between the high flights, the communicated diabolisms. This underscores the moral nature of Grave's objections. Graves admits Milton's "remarkabl e ear for music," which Eliot accepted only much later, when he famously took back much of his anti-Miltonism. They may both have scorned Milton, but their motivations and arguments were entirely different. the sound of the poem is magnificent; only the sense is deficient. Which seems to echo Eliot's objections, but Graves goes on to clarify his quarrel with the sense, and it turns out to be a Pagan Celtic sanctimony every bit as fulsome as the Christian sanctimony of his quarrel with Paradise Lost. Again nothing to corroborate Eliot's points in substance. Eliot's points always carried on far too much of Pope's nonsense in "An Essay on Criticism," a reasonably enjoyable poem as long as you never make the mistake of thinking it has any instructive value for actual criticism (another area in which I depart from Graves, who insists that a poem must be true and apt in order to be enjoyable). Eliot seems to have slavishly applied Pope's petty standards for marking sound against sense, and became thoroughly misled. Sherry uses the main quote of this post to debunk Eliot's claim, and I think she makes a decisive point, except that even she cannot excuse the sheer drudgery of Paradise Lost in the large, which, if you ignore the moral overtones, I think Graves covers in his charge that it is "the poem which has caused more unhappiness, to the young especially, than any other in the language." It's also worth pointing out the undue attention Sherry as well as Eliot and other critics before her, pay to the influence of Milton's blindness on his poetic faculties, which is more of that infuriating 20th century habit of conflating the nature of language, the senses and experience in ridiculously simplistic ways. Graves is far more sensible on the matter, accusing Milton himself, if anything, of making too vulgar a use of his blindness as a device to encourage approbation. You would expect a tidy New Critic such as Eliot to know better than to hypothesize extravagantly about that anatomical detail. I suppose the upshot of today's reading is that I'll be spending a bit more time revisiting Milton's actual text, but unless I suddenly find him much less soporific than I did when I made a serious attempt to appreciate him in the past, I'm not going to pretend I have the stamina for much of his work. The point of escaping into poetry is to enjoy the amenities of the alcove, a notion I would have thought was obvious, but which I've had to suggest to others several times, recently. Thanks very much to those responsible for Versification for having giving me these hours of enjoyment and reflection. It must be a truly thankless task to produce a journal on Prosody these days. Editorial note: You might have noticed I expanded the title of this post beyond the customary "Quotīdiē." I plan to continue doing so. I quoted this poem when prompted for influences in the comment board for "Growing up Misfit." It has been a favorite since I was a teen because it does something that the best poetry does—it immerses me completely in a separate experience. I've been lucky enough to have a happy marriage, but I now know from experiences with others close to me, and cultural observation all around, that I still may never have been exposed to a greater description of a miserable union than "Daddy". Quite possibly it has contributed to my determination not to have an unhappy marriage. A friend recently criticized the poem for Plath's comparison of her suffering to that of Jews in the Holocaust, calling the tactic "incredibly over the top and melodramatic." In considering the charge against this device, I separate aesthetic grounds from moral grounds. Some people have a strong moral objection to making any comparison against the Holocaust. I reject that objection just as I reject all sacred oxen. Every experience, regardless of how horrible, is open to us as a device for self-expression. That is a fundamental basis for empathy. We can and should argue degrees in action and suffering, but we should never be forbidden to enter into such arguments in the first place. There is also my wariness of convention that confines the Holocaust to Jewish experience. Not for nothing does Plath mention her "gypsy ancestress", and I read the line "I may be a bit of a Jew" entirely as a metaphor. That brings me to aesthetic grounds. I agree with the argument that Plath's comparisons tend towards the the grotesque, and it is only her immense expressive skill that rescues it. In general, Plath cannot escape the charge of egotism that goes hand in hand with the confessional movement. What redeems Plath is that her craft and command of words overwhelms and infact elevates her regular meanness to something that escapes escape the trivial quality of her peers. Her poetic faculties expand her work beyond the microscopically narrow paysage in which she threatens to trap the reader, who thus ends up with entire worlds of insight at his unexpected disposal. It's tempting to wonder what Plath might have accomplished had she not fallen so deeply into the school of confessional poets. If she had elevated her themes, as even her husband and tormentor generally attempted; could she have been as definitive in expressing her times as, say, Sappho? Then again that might be ridiculous speculation, because it's quite likely that her style suited the mean more than the large. "Daddy" is indeed over the top, but it is hard to imagine a better way to express the overwhelming extent to which marriage to Ted Hughes suffocated her in a coffin telescoping at its long polygon to her father, and at its short polygon to her suicide. In reading it even as an impressionable teen, I never thought for a moment that her personal tribulations came close to the sufferings of Hitler's genocide victims (Jews and otherwise). Yet the savage insistence of the metaphors did bring to a gut level her overwhelming despair with an intensity so extraordinarily difficult to accomplish through any other means. I think that is what poetry must deliver, even if it sometimes strains natural correspondences in the effort. I find it interesting to compare Plath to another poem about a broken marriage, one widely admired, and by no less than E.A. Robinson, "Eros Turannos." I respect Robinson's effort, and the tidiness of his verse is almost heroic, with each line refusing enjambment and perpetuating a series of small finalities. I have a soft spot for such virtuosity, but I think that "Daddy" demonstrates by contrast the power of immediacy at all costs. Plath's influence on me is very profound. It was really study of Plath that allowed me to grow into acceptance of free verse. So many of the other high priests of free verse, in English and French, including Whitman, Ginsberg and Kahn, left me utterly cold, though recently I've been able to appreciate these a little more. I never believed that LaForgue, Eliot and Pound took as much freedom many claim, and it was Plath, who really showed me that craft and free verse were not incompatible. She made it possible for me to listen properly to the great African poets such as Senghor, Césaire, Okigbo and Brutus for the first time. I wander through my own Journey in Plath (and Hughes), and how it relates to my family in "Slender Mitochondrial Strand". "Morning Song" for Udoka and "Metaphors" for his mother are my touchstones upon the birth of my third child. Having said all that, I think it's perfectly fair for someone to find "Daddy" too grotesque for their taste, and in such cases, I tend to recommend "Mushrooms" instead.